Home Watch Types Automatic WMT Walter Mitt custom watches: I like this. 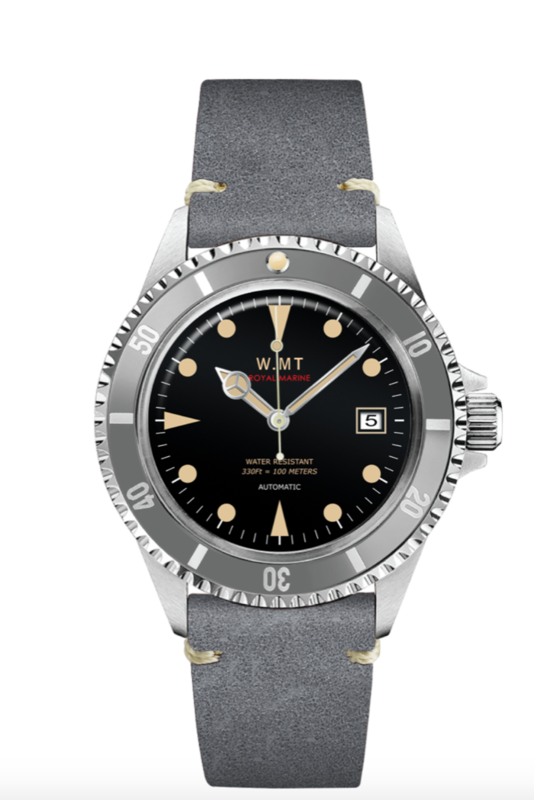 WMT Walter Mitt custom watches: I like this. The customizable watch trend has been growing for the past few years – you go to a site, pick out your dial, hands, strap, and a watch shows up. And that’s fine, but I’ve never been deeply attracted to these kinds of watches.Until now. WMT Watches makes this all better. I had a difficult time selecting the watch I wanted to make, only because so many of the options worked well together. Rose Gold with gold hands and burgundy bezel insert looked interesting. All the options use a 40mm case with crown guards. You get to choose between a coin edge bezel, a scalloped bezel, or crystal retention with no bezel at all. The coin edge bezel has no crown guards and uses a big crown. I went with the scalloped bezel, crown guards combination. In the end, after making 10 different mock-ups, I ended up with a sunburst gray dial, aged lume markers with Tudor-style triangles at 12, 9, and 6 o’clock. Gold hands, a gray bezel insert, and gray suede straps that taper to 16mm at the buckle, make this thing a real treat to look at. It’s capped off by a tall domed mineral glass that matches the vintage feel I was going for. The dial doesn’t glow much at night, but I didn’t expect that it would- vintage colored lume rarely does. One of the neat tricks WMT does is to make the case in different materials. I could have had a sub case in rose gold, and made the crown stainless steel, for a reverse two-tone effect if I had wanted. It’s brilliant. I ended up going with stainless, but that’s because I worry about wearing through the IP coating. WMT also provides an aging service where they will give the watch scratches, dings, and so on. If you chose an IP coated watch with the aging service, it’s possible that it will ding or scratch through the coating, and I’m happy to let the age watch naturally. the light shows the dial as sunburst, or black, depending. Inside is a Miyota 821a movement, and it’s visible through the display back. The Miyota is a simple, reliable movement, and Honestly, everything about this watch speaks to me, except the crown guards. The crown guards angle downwards, and are squared off. I wish they’d been rounded or pointed. As they are, they stick out to me as the one thing I would change. Other things I could have done: for a small upcharge, they’re willing to print logos I could have provided (within reason.) I could have made this thing completely my own. Next time, I will. There are really two things to speak about here: the ordering process, and the watch as delivered. The watch as sent is fantastic. I have no regrets about the range of choices available, and the good results that are possible. I’m not a fan of every dial, but there are enough good options, and the strap and hand choices are excellent. The ordering process is easy. Selecting the dial, hands, case material, crown material, were all easy. I wish there were something I could point at and say, “This! This should be improved!” but honestly, I’m happy. It’s an easy watch to reach for, a comfortable wear, and it turned out excellent. I would wear this thing anywhere. Who we think it might be for: You want a classic watch made just for you. Would I buy one for myself based on what I’ve seen? : Hot damn. If I could make one design suggestion, it would be: Change the crown guards. What spoke to me the most about this watch: The good results and wide range of good choices. Rose Gold with gold hands looked interesting.